This excellent book, newly available in paperback, addresses the growing dissatisfaction with the neo-liberal post-Washington consensus. The concern of the contributors in writing this collection was that this consensus has established itself as a new orthodoxy, more powerful and widespread than its predecessor. This broad-ranging critique explains that without a much broader political economy the consensus is unlikely to provide a coherent framework for successful development policies. 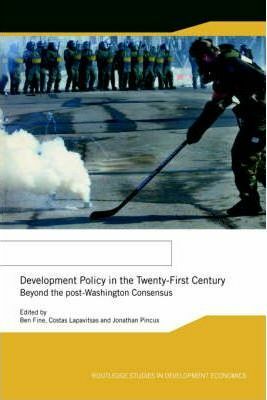 Development Policy in the 21st Century is unique in its depth and assesses the postures of the new consensus topic by topic, whilst posing strong alternatives. It will improve and stimulate the reader's understanding of this important area, and is required reading for any student, academic or interested reader that wishes to understand one of the most important issues in international economics.